(FRISCO, Texas)—Texas Farm Bureau (TFB) voting delegates were unanimous in their decision to strengthen private property rights at the organization’s 84th annual meeting in Frisco that concluded this afternoon. 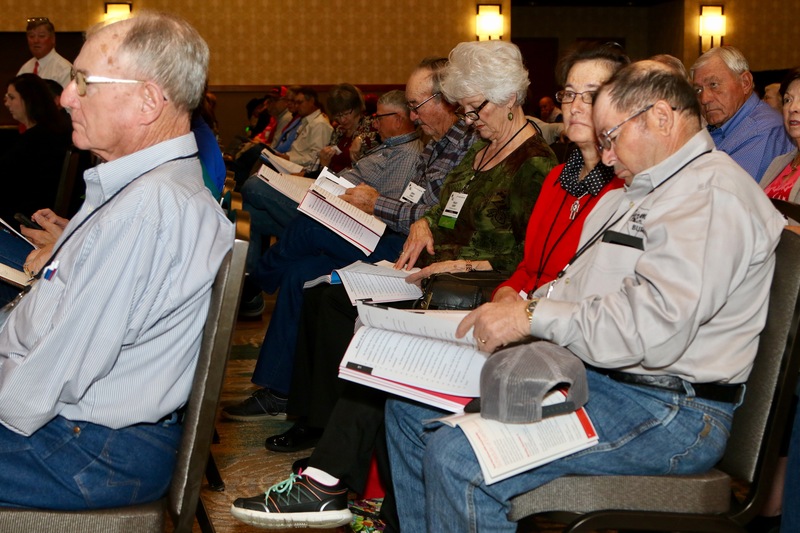 Nearly 800 voting delegates from county Farm Bureaus across Texas adopted state policy for the coming year and recommended national policy positions for consideration by the American Farm Bureau Federation. Seed certification, a program to promote the horse industry, and agricultural practices also topped the list of issues discussed by delegates. Delegates voted to support landowners receiving property right protections in easement terms throughout the eminent domain process—whether the property is acquired voluntarily or through condemnation. The condemning entities should be liable and bound to restore the land to its original condition if abandoned, voting delegates said. Delegates also supported the privatization of Texas seed and plant certification services. It would utilize a non-profit crop improvement association sanctioned by the Association of Official Seed Certifying Agencies through a memorandum of understanding with the U.S. Department of Agriculture. In addition, the delegates supported the establishment of a Texas-bred program to promote the horse industry in the Lone Star State. Commercial farming and ranching practices are often targeted by non-agricultural groups, and TFB delegates voted to oppose any program guidelines set to further those entities’ agendas. The delegates also supported strengthening Federal Aviation Administration regulations on recreational motorized manned aircraft. On the national level, repairing technologically-advanced agricultural equipment was discussed. Delegates supported the right of the equipment owner to repair the machine or have an independent repair facility do so. Delegates also supported funding for programs that allow legal depredation efforts for birds that affect aquaculture production. Texas Gov. Greg Abbott and U.S. Sen. Ted Cruz addressed delegates, vowing their support to protect private property rights and championing agriculture’s role to the state economy. Both officials recognized the impact of Hurricane Harvey on Texas agriculture and the resiliency of the agricultural community in its wake. In other action, delegates elected Boening to his third term as president of the state’s largest farm and ranch organization, which reached a 519,849 member-family milestone this year. Mark Chamblee of Smith County was elected as vice president and Scott Frazier of Nueces County was elected as secretary-treasurer. Re-elected to two-year terms as state directors were Chamblee, District 5; Jessica Richmond of Comanche County, District 7; Larry Joiner of Angelina County; District 9; and Frazier, District 13. Three new state directors were also elected. Pat McDowell of Wheeler County is the new District 1 state director. A former president and board member of the Wheeler County Farm Bureau, McDowell grows corn, wheat and raises cattle. McDowell represents TFB on the U.S. Meat Export Federation and previously represented the organization on the Cattlemen’s Beef Board from 1998-2004. He was the TFB Young Farmer & Rancher Advisory Committee chairman in 1990. McDowell and his wife, Liz, live in Shamrock. The new District 3 state director is Mark Daniel of Seymour. Daniel has served as the president of Baylor County Farm Bureau for 13 years and has also served on the Beef Advisory Committee. He has a cow-calf and hay operation utilizing rotational grazing and fertilizer and weed management. He also owns a cattle trucking service. Daniel and his wife, Teresa, have one son. Allen Kaminski of Austin County is the new District 11 state director. Kaminski served in numerous roles on the Austin County Farm Bureau board of directors, including president for 19 years. He also serves on the Small Farm and Ranch Advisory committee and was the TFB Discussion Meet finalist in 1996. He manages his commercial beef cattle and hay operations on the family farm. Kaminski and his wife, Rebecca, have two daughters. Nearly 800 Texas Farm Bureau voting delegates considered state and national policy resolutions at the organization’s 84th annual meeting in Frisco.